Brenda, from Coffee, Tea, Books and Me has posted about her childhood Christmas memories in a small town. I can relate. I grew up in a small town in upstate New York. I was born in the mid 50's, so I remember the small downtown area that my mother frequented. There was Tomkins and Greens for beautiful clothes and shoes. There was Hanford and Horton for paper and writing implements and stationery. Tomkins was two stories. When you walked in the front door, you saw two semi-circular staircases towards the back of the first floor, that led to the second floor, which was a kind of loft. It really had somewhat of the design of a present day two story mall store, except instead of escalators there were real staircases that hugged the wall on either side of the first floor. There were several tables with various goods such as makeup, hose, women's hats and gloves, handkerchiefs - an entire table of handkerchiefs that could be monogrammed. There were well dressed ladies - one of whom was Mrs. Tomkins - to wait on customers. There were glass cases full of articles of clothing, as well as racks of clothes towards the back. That was just one store. There was Newberry's and Woolworth's where there was a full luncheonette counter where one could have grilled cheese sandwiches that were delicious and came with a pickle. Both these stores were five and dimes, and had a tremendous variety of merchandise, toys as well as articles for grownups. Green's was another fine clothes store. 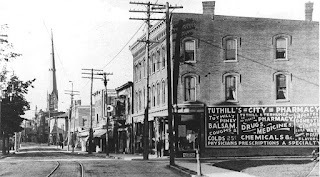 The best was Carson & Towner's - they were the "Lord and Taylor" of our town and "Kastles" the best of the best. The prices were high, but the staff was extremely helpful and customer service was everything. I can still remember walking into the downtown area from our home - perhaps it was a half mile. Sometimes we took the little bus that came to within a block of our house. The bus let us off in front of the library - a great granite two story building with huge granite steps and giant floor to ceiling windows that remained open in the summer to let in the cool evening breezes. 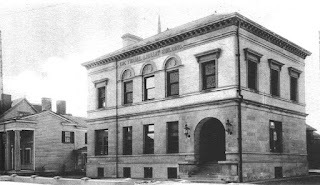 This library had been a former home of one of the elite in town, and was donated to the town for use as a library. There was a huge fireplace on the first floor that was no longer used. There were huge real wooden shelves and reading areas, much like a Barnes and Noble today, but with real wood and real character - no coffee, however. When the bus would let us off, we would have to go around a corner to get to North Street and the main shopping street in town. I would be grasping the hand of my mother as we got ready to round the corner onto North street. In the winter, there was, inevitably, a biting, cold wind that took my breath away as soon as we rounded the corner. I always had to tuck my scarf up around my mouth and nose so as not to get my breath torn away - and gasp - as the freezing wind tore at my garments. Once we rounded the corner, it became manageable and the wind wasn't so bad - it just "hung around" at that particular corner for the sole purpose of sucking the breath of unsuspecting small children. When I was older, my dad used to take me for hot chocolate to Bay's Drug Store - at their luncheon counter. All the drug stores and five & dimes had luncheon counters. Once the 70's came, I was a teenager, and the town built it's first mall. I worked in so many of the stores in that mall - and it never had the character of downtown. By the time I got married, that mall was becoming obsolete. In 1993, I spent the summer with my parents, as I was getting divorced, trying to get my feet under me - and they were also trying to sell our house, the one I grew up in, and move permanently to Florida. It was a summer of change for me. There was a new mall by that time. What waste. The old mall had closed and was empty. What had once been a thriving presence where everyone shopped, as had been the downtown area before it, was now a big, empty comcrete structure covered with graffiti - and crumbling. It made me feel old to see it, since I had worked in so many of the stores there as a teen. I think times HAVE changed - and not for the better. Hence, the look back at yesterday. I am convinced that it isn't just maudlin sentimentality that makes me look back and think that times were better. This is North Street but farther down from the center of town. Down where Hanford and Horton's was in the 60's and 70's. The firehouse at the top is where I took my "babysitting course" when I was 13 years old. It was offered on the 2nd floor and covered all one would need to know when one is in charge of children for an evening. First aid was the primary purpose, and I did learn and acquire a certificate from taking this course. This is a view I remember. You see the corner on the left? That is the wind corner. That is where Orchard Street met North Street. The old Thrall Library building is on the left out of the picture. When we came around that corner on the left, the North wind would meet us on North Street. 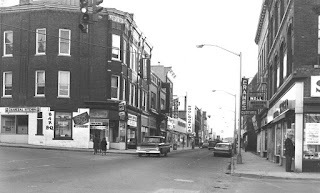 As you look down the street, there is a Woolworth's sign and farther on was Tomkins and Green's, Newberry's and Bay's Drug Store, where I had my first job at age 15. You should have added that you worked at Bays!!!!! I remember Dad going to pick you up after work. . .
hmmmm. something about him driving through the window???? or do I have that wrong?? ?